Another in our popular series of shaped books telling the still pertinent story of two ways of life. Good stories never lose their power. Aesop, an ancient Greek, first wrote this tale of a country mouse who samples the life of her city cousin, and finds the simple peace of the country far preferable. Ethel Hayes, the illustrator, has changed the cousins from male to female so that she can indulge her talent for rendering beautifully dressed mouse ladies. 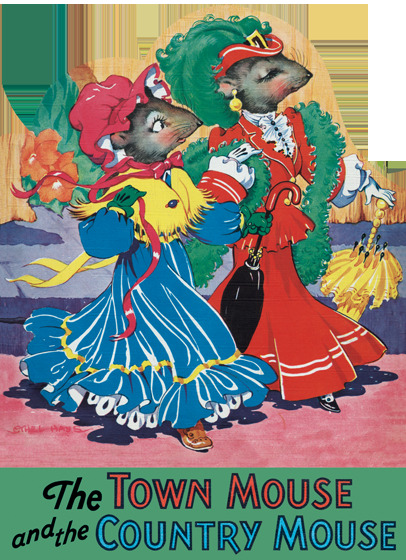 Even the country mouse's Sunday best is outshone by the city mouse's complex and fashionable wardrobe.